Paige A. Allen, MS, RVT, is a Distance Learning Instructional Technologist with the Veterinary Technology Program, Purdue University, College of Veterinary Medicine. She earned her AAS in Veterinary Technology in 1984 from National College, Rapid City, SD. In 1996 she earned a BSBA from Indiana Wesleyan University, Marion IN, and in 2005, earned her MS in Educational Technology at Purdue University, West Lafayette IN. In 2008, Ms. Allen earned an Award for Excellence in Distance Education. Ms. Allen’s career encompasses private practice and several positions at the Purdue University College of Veterinary Medicine, including Food Animal Technician, Large Animal Surgery Technician and Director of Central Supply, and she joined the Veterinary Technology Distance Learning department in 1999. She’s been an active member of NAVTA (the National Association of Veterinary Technicians in America) since 1986 and has served as Chairperson, Nomination and Election Committee; Chairperson, New Member Committee; Chairperson, Information Committee and was an Indiana State Representative in 1994. 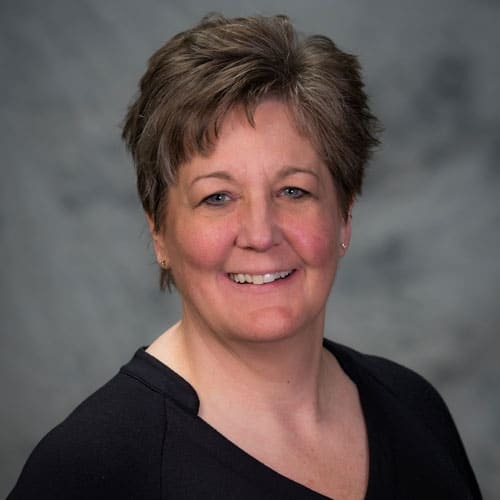 She has also been an active leader in the Indiana Veterinary Technicians Association since 1986 and served as its President in 1994 and 2007 as well as other leadership roles. In addition, she’s an active member of the Association of Veterinary Technician Educators and the Advisor to the Purdue Student Chapter of the North American Veterinary Technician Association from 1988 to 1995 and 1997 to 2002. She’s a huge fan of Star Trek (“even the bad ones”), Bed of Roses (“sappy love story”), Lord of the Rings, Game of Thrones (“way before the TV series”), anything by Stephen King, Dragonriders of Pern series and Twilight (“guilty pleasure”), and enjoys singing, gardening and reading. When did Paige first know you wanted to be a veterinary professional?